The Legends Golf and Country Club is a 27-hole championship golf course that offers a variety of challenges for all levels of golfers. Situated north of Sherwood Park, the course combines spectacular views of the North Saskatchewan River valley with a tranquil setting to provide the golfer with an exciting and enjoyable golf experience. 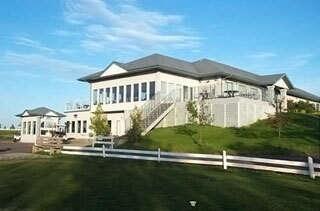 The Legends clubhouse with a 3000 square foot banquet room and deck can accommodate groups of any size. The clubhouse also houses the Legends restaurant and pro shop with a complete line of clothing, equipment, and merchandise for all your golfing needs. In addition, a variety of golf antiques, prints, and photos adorn areas throughout the clubhouse. Proximity markers (long drive, closest to the pin, long putt, etc.). Please ensure that information is given to the pro shop staff at least two days before your tournament to ensure markers being available. A starter will be provided. One cheeseburger per person served with potato salad, pasta salad, baked beans, coffee, tea, and dessert The cheeseburger meal is not available with the steak or chicken meals. Contact the club for current pricing on beer, coolers, hi-balls, pop, and juice. A $200.00 non-refundable deposit is required seven days from date of booking. Tournaments may be booked up to one year in advance. The minimum number of players required to book a tournament is 36. A minimum of 36 golfers with meals is required to book a tournament before 4pm on weekends. Final payment for your golf and meals is required seven days prior to your tournament date. We will gladly accept the following forms of payment: Visa, MasterCard, debit card, money order, or business cheque. “Shotgun Start” will start at 8am unless otherwise approved by the golf club. Legends would like all shotguns to be 144 golfers. The minimum number that we can accept is 120 golfers. Please note that if there are less than 144 golfers booked, Legends reserves the right to fill the unused tee times with other golfers (i.e. members, public). Tournaments will be required to play in light rain. Tournament coordinators should inform players that the tournament is “rain or shine.” The golf portion will be cancelled in the event of heavy rain or snow making the course unplayable. The decision to cancel will be made just prior to your time of play. Play will be suspended in the event of lightning. Play will resume if the delay is less than 45 minutes. In the event of cancellation, our banquet room will be available for your meal. There will be no refunds on meals. In the event of cancellation of play, the green fees will be refunded or rainchecks will be issued to each player. The choice of refund or raincheck will be made at the discretion of your tournament committee. It is the responsibility of the tournament committee to advise all participants of the golf course rules. No personal alcohol allowed in accordance with Alberta liquor law. No personal alcohol is allowed on golf course premises. Individuals not adhering to this rule will have their alcohol seized and not returned, and be asked to leave the course without refund. Dress code is in effect at all times. Golf shoes or soft-soled shoes are required. Golf shoes will be required to be non-metal spike. Jeans are allowed if in good condition. Muscle shirts are not allowed. Any group of players falling behind more than one hole may be asked to step aside to let the group behind play through. The course marshal controls flow of traffic on the golf course and co-operation between the marshal and golfers is a must.